It's that time of year again! I'm once again thrilled to be partnering with the BabyTime Show as one of their featured bloggers. This season's event takes place Friday, April 26-Sunday, April 28 at the International Centre in Mississauga. As always, I will have some GREAT prizes leading up to this year's event including FREE tickets to the show, a Barney prize pack and something sweet from one of my fave companies...Britax! Stick to my blog for more details coming soon! 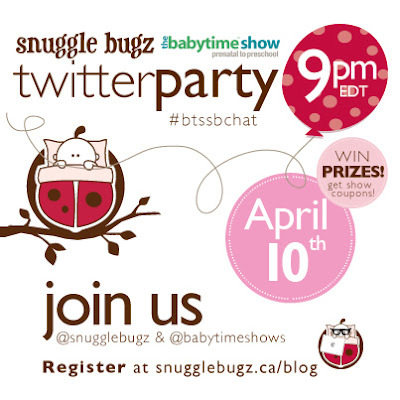 But first, BabyTime Show will be having a twitter party TOMORROW @ 9 p.m.! Please see the info below! Hope to see you there!